Avon Beach is a very pleasant short walk along the Quay and promenade. With it's Blue Flag and safe bathing water (lifeguard patrolled in season) it is a fantastic place to spend the day swimming, sunbathing or building sandcastles. Avon Beach has a cafe that does great breakfasts and lunches or in the winter a great Hot Chocolate or Cappuccino. Numerous activities can be enjoyed from beach volleyball to banana rides and watersports hire. 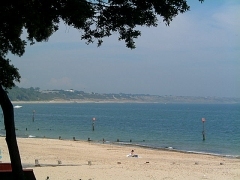 The walk along Avon Beach towards Highcliffe is a must and has plenty of places to stop for a coffee or sit down.